Time of client device in hubzilla timestamps - a bug or feature? 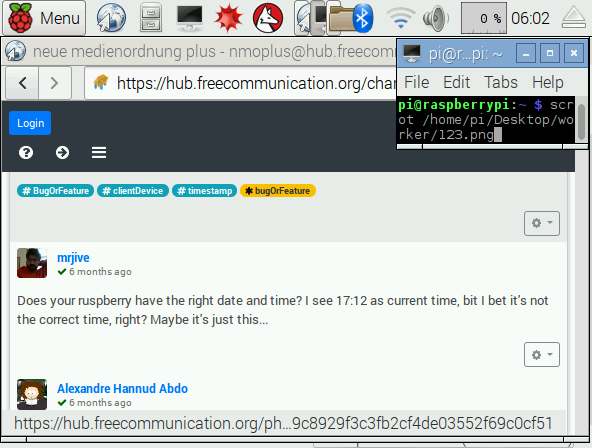 I browsed the thread start.hubzilla.org erroneously as open hub declared from 19.11.2017 with one Raspberry PI. Can you find one bug here? Is it a bug or feature, that hubzilla use time of client device in hubzilla timestamps? In my opnion, is it a bug. Please Vote: Bug - yes or no? Seems to be a feature. I wanna know the time in reference to my time, not the server's time. I wanna know the time in reference to my time, not the server's time. In my opinion it is useful for time-Tags in those events as sent time of message in ZOT-Netzwerk use the UTC https://en.wikipedia.org/wiki/UTC . What is in your channel settings? (Settings => Channel Settings => Time Zone) You can pick UTC (Other) or any other time zone of your choice. My channel settings was Timezone: Berlin. I tryed with Timezone: UTC - produced no improvement, no changes for displayed timestamp. //EDIT: The bug is caused by assumption, that time of client device is correct. If client device time is wrong is time information also buggy. //EDIT2: no changes for age of posts.